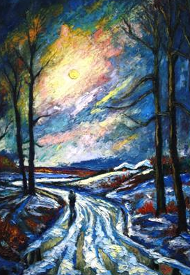 Two Regimes is the life’s work of two women: A Mother (Teodora Verbitskaya), who wrote about her life from 1920 to 1945, and her daughter Nadia Werbitzky, a professionally trained artist- who painted from memory! Teodora and Nadia were witnesses to both the Holodomor and the Holocaust in Ukraine. “Two Regimes”, tells a true and powerful story of survival under the two regimes of Stalin and Hitler: before, during and after WWII. Teodora’s Christian family witnessed first-hand, the atrocities of two brutal dictators during their reigns of terror that starved entire populations and forced 7,500 Jews from Mariupol, to their murderous deaths- at the hands of the Nazis- in Ukraine, in 1941. Afterward, Teodora and her two daughters were sent to Germany to serve as slave laborers. The forced labor camp (that held Teodora and her daughters) was liberated by United States soldiers in 1945. Teodora then immigrated to welcoming Canada- after spending time in displaced persons camps! Two Regimes was written to validate the lives of those Ukrainians; Jews, Greeks, and others whose lives were lost and whose voices were silenced forever. 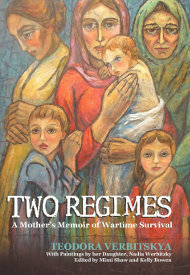 Two Regimes – A Mothers Memoir of Wartime Survival is the story of Teodora Verbitskaya and her young daughters, Nadia and Lucy; who were swept up in the collateral damage of war and survival- before, during, and after World War II. This memoir (Two Regimes), is the story of three young women’s love, faith, courage, strength, determination, intelligence, and sheer will to live – in the face of the worst adversity! This true survival experience is an inspiration to everyone, but particularly for girls and women, who must often pick up the pieces during or after war to start life anew. The art and manuscript of Two Regimes, with paintings by Nadia Werbitzky, provides the perfect resource for springboarding a multi-course study for in-class discussion. The study of this collection can host or facilitate important conversations regarding the impact of World War II on families both then and now. 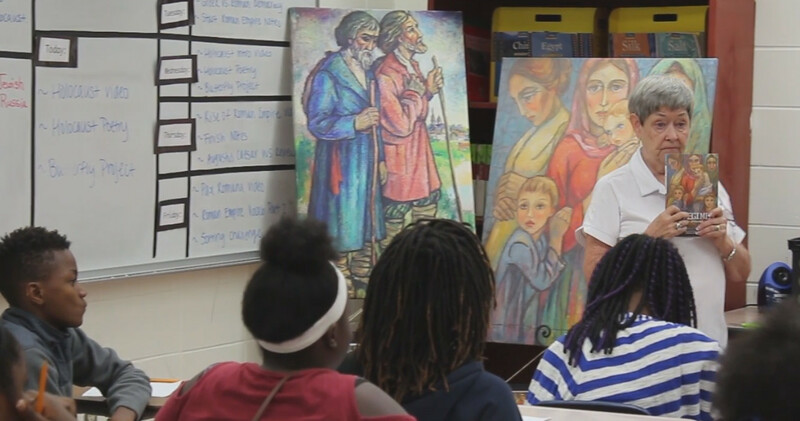 Our goal is to provide Two Regimes as a primary resource for guides and lesson plans for grades 4-12, utilizing this true story as a foundation for study. In this remarkable memoir, both mother’s and daughter’s works were created decades apart and published posthumously, thus Two Regimes brings their works together for future generations. Two Regimes meets FOUR mandates. These four mandates address Women, Character, the Holocaust and Genocide Education. Importantly there are a number of situations in Two Regimes that magnify the issue of bullying and how the family was able to cope with it – creatively. A copy of the book Two Regimes was hand-delivered and accepted into the library of Yad Vashem in Israel by Dr. Miriam Klein Kassenoff, Holocaust Educator and Child Survivor of the Holocaust. Proceeds will be used for the restoration of the remaining paintings. We greatly appreciate your support.